Students will learn the basic techniques of bead weaving, no experience necessary. We shall start with simple off loom techniques and design then advance to making our own loom and creating a project with it. We'll start with the easiest projects first to make sure students can gain confidence in their beadwork. Students will be guided through the steps of designing a beading pattern on paper with emphasis on elements of art and principles of design specifically color, texture, line and movement. Sources of inspiration will be discussed and students will be encouraged to express their individuality and creativity. These paper bead designs will be used as the beading pattern/blueprint. Beading will be accomplished using glass seed beads and nylon thread. Every class lasts an hour and a half, though I will typically be set up ten to fifteen minutes before each class. Every class will begin by the students choosing their color scheme from the different options provided - I strive to make sure that no two students will go home with the same color scheme, ensuring a totally unique looking piece of wearable art. Once everyone has their materials, and is prepared to begin, I will demonstrate the technique used that day before letting the students loose to try their hand. Questions are answered and problems are attended to in the order that they arise. 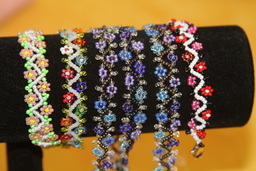 I will demonstrate the beading technique and provide patterns as well as allow the students to experiment until they become comfortable with the techniques we will cover. This hands on approach can provide insight into the traditions and art of different cultures. Although our focus will be on Native American beadwork, specifically, Pottawatomi and Ojibwa, elements of Czech and Russian design will also be integrated into the class structure. Provided materials include: All patterns, beads, Nymo string, or other stringing material, needles, beeswax, glue, or specialty clasps will be provided. NOT PROVIDED: Parents will need to provide clasps and findings that will suit your student’s tastes. A simple ten pack of lobster clasps, magnetic clasps, or the like will do perfectly fine. If your student has any metal allergies, please be sure they have a package of earwires that will address that. All findings I provide will be made of Stainless Steel or aluminum. In addition, your student will need the following - please bring all materials to every class. A small pencil box or rubbermaid container to hold the packaged beads, rings, needles, and wax they will be taking home - as well as any finished or unfinished projects. Any findings needed for the day. I will demonstrate the beading technique and provide patterns as well as guide students individually in the more difficult sections of beadwork.